City Developments said on Tuesday that it would invest HK$237.81 million, or around S$41.4 million, in the IPO of E-House, China’s largest real estate agency service provider. “Aside from investing in residential, commercial and mixed-use projects in Shanghai, Suzhou and Chongqing, the next logical step was to invest in the nation’s top sales agency with an extensive network of agents and a deep, robust database for purposes of research and analytics,” Sherman Kwek, City Developments’ CEO, said in the filing to SGX on Tuesday. “We see strong potential in E-House’s growth. As it expands not only in China but also globally, we will be able to leverage its network, platform and expertise for CDL’s residential projects in various countries,” Kwek said. “CDL is very honoured to be invited as a cornerstone investor in E-House’s IPO,” he added. City Developments was the only Singapore company invited, it said. China developers including China Evergrande, China Vanke and Country Garden are existing E-House shareholders, it said. Chinese tech giant Alibaba is also a cornerstone investor, as is state-owned enerprise developer Overseas Chinese Town Holding and an associate company to Hong Kong developer Henderson Land Development, it said. E-House operates in 186 cities in 30 Chinese provinces, with a network of more than 17,000 sales agents, and its main businesses are E-House Marketing, which is a primary-market real-estate agency service, CRIC, which is a real-estate data consultancy, and Fangyou, which is a real estate brokerage network service, the filing said. E-House’s residential-project marketing business generated 3.9 billion yuan of revenue in 2017, the filing said. ST Engineering and the Singapore government’s industrial infrastructure planning agency JTC signed a memorandum of understanding on Tuesday to form a strategic partnership to design, develop and deploy an open digital platform for Punggol Digital District, it said in a filing to SGX. “Under this partnership, both parties will work closely to integrate smart city solutions on to this Open Digital Platform across the 50-hectare District. Both JTC and ST Engineering will co-invest equally to bring this project to fruition,” the filing on Tuesday said. The platform will integrate smart city solutions such as facilities, building and estate management systems, district cooling systems, pneumatic waste conveyancing systems, autonomous goods delivery systems, security systems, carparks, traffic lights and autonomous vehicles, it said. The MOU with ST Engineering was the first step to establish a strategic partnership with a company to develop the platform and other industry partners, including SMEs, will get opportunities to further develop services and infrastructure for the platform, it said. Singapore Exchange said it launched a new foreign-exchange product, SGX FlexC FX Futures, which allow market participants to trade customizable foreign exchange futures in an over-the-counter manner and clear the trades on SGX’s platform. SGX FlexC FX Futures allow bilateral trades which are privately negotiated with tailored expiration dates to be registered and cleared like a standard SGX FX futures contract, the exchange said in a filing to SGX after the market close on Tuesday. The product will be available for contracts on the Indian rupee against the U.S. dollar, the South Korean won against the U.S. dollar, the Taiwan dollar against the U.S. dollar, the dollar/offshore yuan and the U.S. dollar against the Singapore dollar, it said. “Access to counterparty credit, especially for tenors longer than spot, is increasingly scarce and expensive in the OTC FX markets. To encourage broader adoption of price risk management in Asian FX, SGX is proud to announce the innovative FlexC FX Futures,” Michael Syn, head of derivatives at SGX, said in the statement. Singapore is the biggest foreign-exchange trading center in Asia and the third-largest globally after New York and London, it said. SPH REIT reported net property income for the fiscal third quarter ended 31 May was S$40.6 million, down 3.8 percent on-year, on lower revenue from mall-and-office development Paragon, the REIT manager said in a filing to SGX after the market close on Tuesday. Income available for distribution to unitholders was S$35.1 million in the quarter, down 1.7 percent on-year, while the distribution per unit (DPU) was steady at 1.37 Singapore cents, to be paid on 17 August, it said. The year-to-date aggregate DPU was 4.11 Singapore cents, it said. Paragon posted a negative 6.2 percent rental reversion for new and renewed leases for the fiscal year-to-date, due to leases committed a year ago during the retail sales downturn, the filing said. “As part of our long-standing philosophy of partnering tenants for mutual sustainability, the rental negotiation with tenants took into consideration occupancy cost and we continue to work closely with them as they ride through cyclical and structural changes,” it said. The Clementi Mall posted positive rental reversion of 5.3 percent fiscal year-to-date, with 3.2 percent of the mall’s net lettable area renewed, it said, adding the overall portfolio saw negative 6.0 percent rental reversion. GuocoLand said its indirect, wholly owned subsidiary First Meyer Development successfully tendered for the en bloc acquisition of the Casa Meyfort Condominium and exercised its option to purchase for S$319.88 million. The acquisition and development of the property will be financed by internal resources and bank borrowings, it said in the filing to SGX after the market close on Tuesday. Frasers Commercial Trust entered a deal to divest its 16-storey commericial property at 55 Market Street in Singapore for S$216.8 million to an unrelated third party, the REIT manager said in a filing to SGX after the market close on Tuesday. 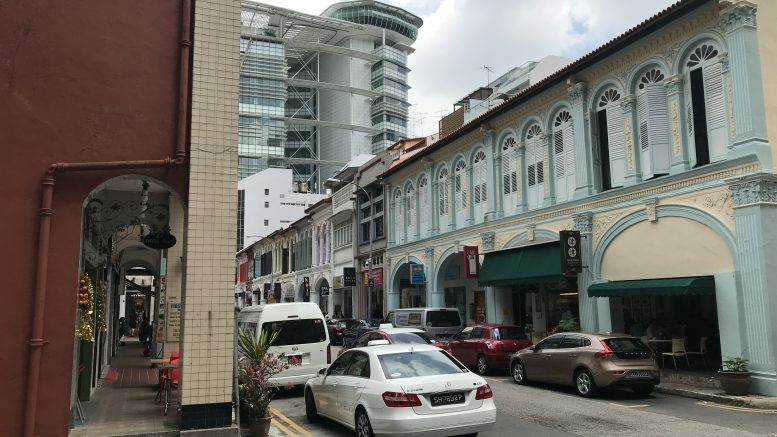 The sale price, which was equivalent to S$3,020 per square foot based on the building’s net lettable area, marked a 44.5 percent premium above the property’s S$150.0 million valuation at the beginning of July, and was nearly three times the original purchase price of S$72.5 million in 2006, it said. FCOT expects to recognize an estimated net gain of around S$76.5 million over the property’s book value of S$139 million as of end-September, it said. The deal is expected to be completed by 31 August, it said. Wee Ee Cheong, CEO of deputy chairman of UOB, saw his deemed interest in shares of property developer UOL rise to 27.575 percent from 26.839 percent, according to an SGX filing on Tuesday after the market close. His direct interest remained at 0.038 percent, it said, bringing the total interest in UOL to 27.613 percent. That was after Wee Investments purchased 6.2 million shares at S$6.8894 each in a market transaction on Friday, it said. Wee Ee Cheong is deemed to be interested in the shares held by Wee Investments, it said. Wee Ee Lim, deputy chairman of UOL, was also deemed interested in Wee Investments and his deemed interest in UOL rose to 13.896 percent from 13.16 percent, it said in a separate filing to SGX on Tuesday; his direct interest remained unchanged at 0.031 percent, it said. Wee Ee Chao, a director of UOL, was also deemed interested in Wee Investments, and his deemed interest in UOL rose to 13.929 percent from 13.193 percent, it said in a separate filing to SGX on Tuesday; his direct interest of 0.004 percent was unchanged, it said. Shares of UOL ended Tuesday up 0.15 percent at S$6.72. Yongnam Holdings said it landed four Singapore-based contracts worth S$23.0 million. Two of the contracts were for the supply fabrication and delivery of structural steel kingposts for a new 12-storey block at Singapore General Hospital and for a mixed development project in Bidadari, it said in a filing to SGX after the market close on Tuesday. Both projects are expected to be completed by the end of this year, it said. The other two contracts were for structural steelwork in the construction of an industrial development, it said, adding the two project are expected to be completed by the first quarter of next year. The contracts were expected to have a positive impact on Yongnam’s financial performance in the current financial year, it said. Oxley Holdings said the issued and paid-up capital of wholly owned subsidiary Oxley Jasper was increased to S$2 million from S$1 via the subscription of 1,999,999 new ordinary shares at S$1 each by the company, it said in a filing to SGX on Tuesday. The increase was funded via internal resources and wasn’t expected to have a material impact on earnings per share for the current financial year, it said. Low See Ching (Liu Shijin), the deputy CEO and executive director of Oxley Holdings, on Tuesday purchased 1,974,700 shares of Oxley Holdings in the market for S$0.35246 each, according to a filing to SGX on Tuesday after the market close. That brought Low’s direct interest in Oxley to 27.67 percent, up from 27.63 percent, it said. Shares of Oxley ended Tuesday up 7.58 percent at S$0.355. Accordia Golf Trust said that it had 495,467 players on its courses in June, down 3.7 percent on-year, and down from 556,000 players in May and 524,000 players in April. The utilization rate fell to 78.2 percent in June, from 84.9 percent in May and 83.2 percent in April, it said in an SGX filing on Tuesday after the market close. For the April-to-June period, it had 1.576 million players, down 2.6 percent on year, with a utilization rate of 82.1 percent, down 2.1 percentage points on-year, it said. World Class Global said on Tuesday that it would recognize revenue of A$156.8 million from the first-phase handovers of its Avant and Australia 108 projects in the first half of 2018. Additional revenue of up to A$361.3 million could be recognized between July and October, WCG, which is the property arm of Aspial Corp., said in a filing to SGX after the market close on Tuesday. As of the end of June, purchase settlements for 195 units of the Avant project were successfully completed, representing more than 96 percent of the 203 completed units, amounting to A$101 million in recognized revenue, it said. The Australia 108 project successfully settled 108 units as of the end of June, or 38 percent of the 277 completed units, amounting to A$55.8 million in recognized revenue, it said. “The strong settlements from the first phase handovers of Avant and Australia 108 is a firm indication of the overall health of Melbourne’s property market,” David Ng, executive director and CEO of WCG, said in the statement. Asiatravel.com said that Singapore’s Accounting and Corporate Regulatory Authority (ACRA) approved its application for a further extension to convene its annual general meeting. In line with the approval, the company will hold its AGM on 25 July, it said. Ryobi Kiso said on Tuesday that it has received letters of demand from certain bondholders alleging a default event occurred under bonds issued to them and they are seeking repayment of an aggregate S$1.75 million and any accrued interest. The company also said in the SGX filing after the market close on Tuesday that it had received letters of demand from various creditors and its related companies for an aggregate S$6.209 million. Additionally, legal proceedings against Ryobi Kiso have been started by certain creditors for an aggregate S$235,711. Subsidiary Ryobi Development also received a letter of demand from a related company for S$1.022 million, it said. “The company, together with its financial and legal advisers, is assessing the impact of the matters above on the banking facilities and project contracts of the group,” it said.